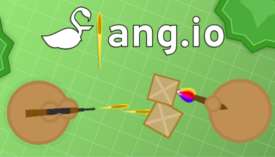 Flang.io | Play Flang.io free on iogames.space! Welcome to Flang.io. In this .io game you will need to shoot, build, and join a team to survive. Use WASD to move and Left Click to shoot. When you first hop on you will notice that there are trees, these trees can be mined to get wood and experience. Another way to get experience is to kill other players. After you have enough experience you can level up by pressing q, this will pop-up a menu in which you can choose a gun. The guns will be significantly better than the one you started out with. There are 9 guns and more to be added in the future, make sure to use them all and discover your favorite. Every weapon has a different path, for example; let us say you choose an automatic pistol, the next level you get an assault rifle. Be careful though, only pick fights you know you can win, because when you die you lose all your experience. If you do not have a good weapon, you can hide behind trees when people are attacking you. Even if you have a good gun, do not go around battling everyone, take sometime to let your health regenerate! But, this game is not only about shooting! If you have 20 wood you can place a wall. Unleash your creativity; you can make a house with friends, build a giant wall, or draw images. Walls have 20 health, and can be destroyed by being shot at, so you will not be able to place a wall down and camp behind it. The leaderboard is based on kills, so do not only focus on building! Sometimes, you can get in sticky situations where you will need to use building to your advantage. Let us say there is a sniper following and shooting you down, you can build cover to get out of there. While the drill does not do damage to players, it is essential to know how it functions. Click and hold on a tree to active the drill, once activated the drill with give you 1 wood every second you are touching it. After the tree is damaged enough, it will be destroyed and you will gain 20 wood. To become a pro, you will also need to know weapon balance! The MP9 excels at handling multiple people rushing you. The AK47 is great at doing a lot of damage at a player, while also being able to shoot fast. The Double Barrel is amazing at destroying walls, and close quarter combat. The Lapua Rifle is a powerful sniper, able to take out level 3 people in 2 hits. The Astrolux-CG92 is a builder's weapon, when a bullet hits it pushes people away and deals 11 damage. Lapua Rifle outranges Double Barrel, MP9 outfires Lapua Rifle, Double Barrel beats AK47 and MP9, and Astrolux-CG92, if used correctly, can space out Snipers and Shotguns. Try them out yourself in Flang.io! Mobile Update Dec 10, 2018 -Fixed major bugs, that made mobile players appeared to be hacking by damaging everyone in the server using the joystick.